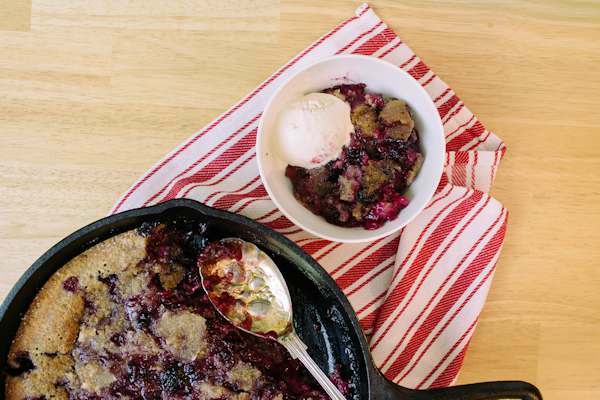 When its blackberry season, it’s the perfect time to make Skillet Blackberry Cobbler. Its a southern tradition with a simple crust for this tasty dessert. I love picking blackberries and that goes all the way back to when I was younger. During summer and I was at Girl Scout camp, there were wild blackberry bushes growing in the woods. And it always seemed to be the perfect time to pick them when I was there. I remember the year our group was told we were going on a survival trip for one night. I wasn’t worried because I knew the blackberries would be our meal for that night. One thing about wild blackberry bushes is they do have thorns. Thick, sharp, cut your skin thorns. But it didn’t matter. 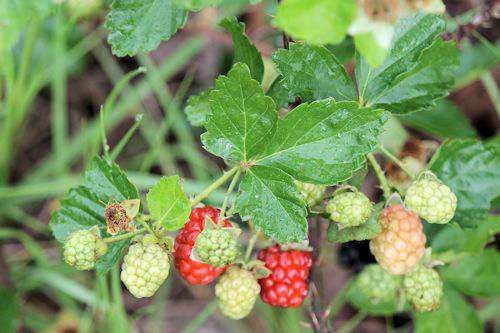 The berries were always so good and such a treat when you were tired of camp food. I now get my blackberries from one bush I have in my yard. And yes, it has the same thick, sharp, cut your skin thorns. But, I learned my lesson and now wear thick gloves when I pick early in the morning. My bush came from a fellow gardener who gave me a sprout of her 100-year-old heritage bush. It didn’t take long for that bush to grow and start producing. Blackberry bushes love to climb, so if you have a fence they will love it there. You can see in the picture above that my bush does produce nice clumps of berries. I know there are varieties of blackberry bushes out there which are thornless, but I’m not sure about the taste of the berries. I have heard the Burpee Thornless Blackberry was a good variety for zones 6 – 10. If anyone has a variety of blackberry bush that is thornless which produces nice sweet berries, let me know. I will wash the berries, drain in a colander and let them dry on a sheet pan. After they are completely dry, I set them in the freezer to flash freeze and then place in a gallon freezer bag. After I have a gallon bag filled, its time to make my Skillet Blackberry Cobbler with homemade ice cream on the side. Preheat over to 350 degrees and put your 10" skillet in the oven while it heats up. If you are using fresh berries, wash and pat dry. Pour the batter into the hot skillet. Sprinkle the berries evenly over the batter. Sprinkle 1/4 cup of sugar over the blackberries. Sometimes I add a bit more sugar depending on the sweetness of the berries. Bake for about 1 hour until golden brown and bubbly. Sprinkle a couple to teaspoons of sugar on the top of the cobbler after bringing out of the oven. Top with whipped cream or your favorite ice cream. What is your favorite way to use blackberries? Yes please. I Just love berry cobblers. This one looks fabulous. Perfect for the summer! Oh my goodness I need to try this! It sounds absolutely amazing, I do love a good blackberry pudding as well. The blackberries cobbler look so yummy. I would love a bite. Thanks for sharing. Thorns or not, I love picking wild (and wild-ish) blackberries. ???? Thisbrexipe looks delish!! I don’t often make desserts, but this, is certainly worth a try! ???????? I am not a huge blackberry fan, but you had me as soon as i saw that it gets cooked in a cast iron skilled. I am genuinely a fiend for cooking in my cast iron! I loveeeee blackberry cobbler! Yours looks delicious, and I love that you serve it with ice cream. Such a perfect dessert! Blackberries are one of my favorite berries. This look so good I would love this cobbler with some vanilla ice cream! My husband loves blackberries – a lot! I am saving this recipe and I will definitely try this one! I just love baking with these summer delicious fruits! Your cobbler looks so delicious! 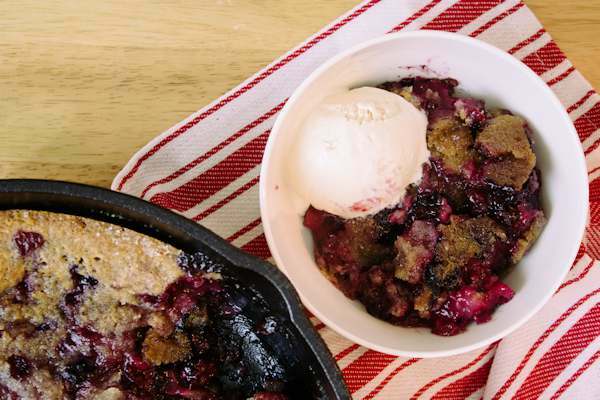 I never had a berries cobbler before but it looks so good! oh man i want to have some now! i need to try this recipe! I love berries. Because I love its tangy taste coupled with sweetness of the bread and some cream on top. Ooh, heaven! This looks so delicious and yes, it would be perfect with a scoop of ice cream! 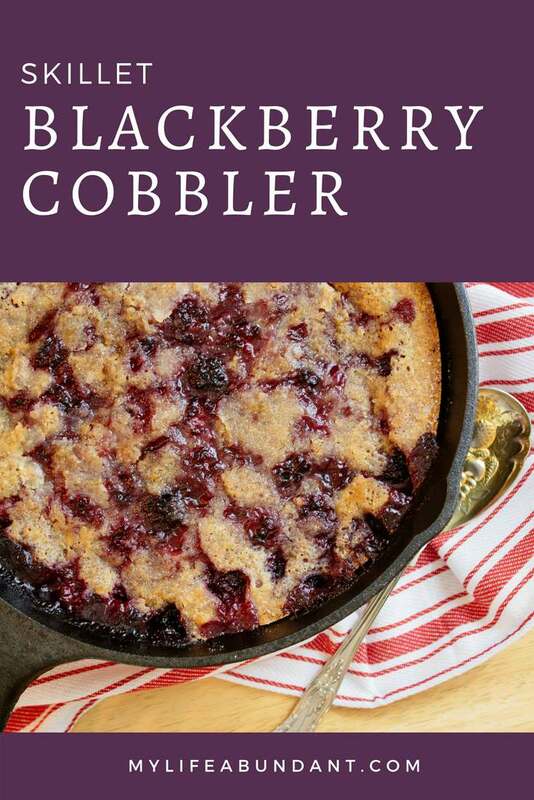 I have never had a blackberry cobbler before but this looks delicious. I bet my family would love this!